A friend of mine suggested a trip with Eco-Traveller, a women run sustainable adventure travel enterprise owned by Tanya Roy. 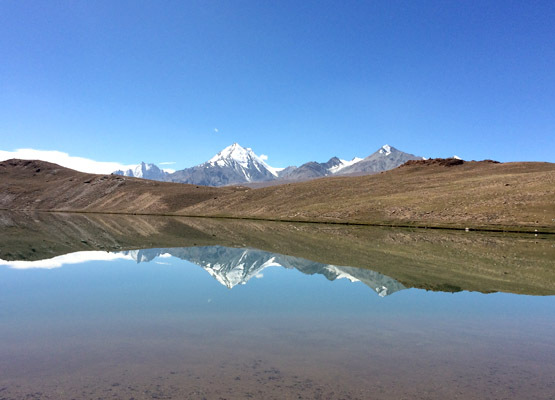 I opted for a three night-four days tour to Chandrataal, a high altitude sweet water lake in the highlands of Spiti valley, located at the height of 14500ft. I stay in Delhi so boarded an overnight Volvo bus from Delhi to Manali, where our stay was arranged in a country side guest house called Leki run by Sunil, who was very hospitable and helpful. 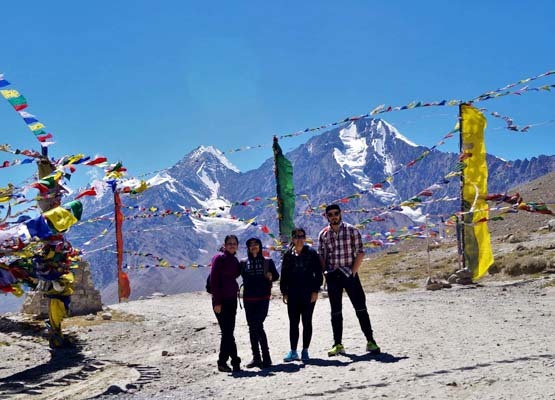 We spent the entire day going around old Manali , visiting temples and cafes. Dinner at Drifter’s cafe was amazing and we retired early to bed as we had to start quite early the next day. We left at sharp 6am. Eco traveller had arranged a vehicle and Tanya had accompanied us. 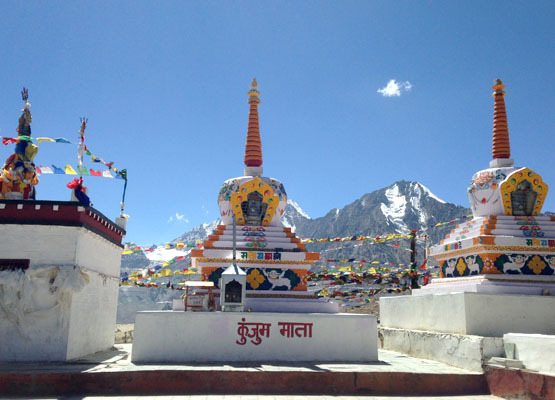 It was a six hour drive till Kumzum pass through different altitudes and landscapes. 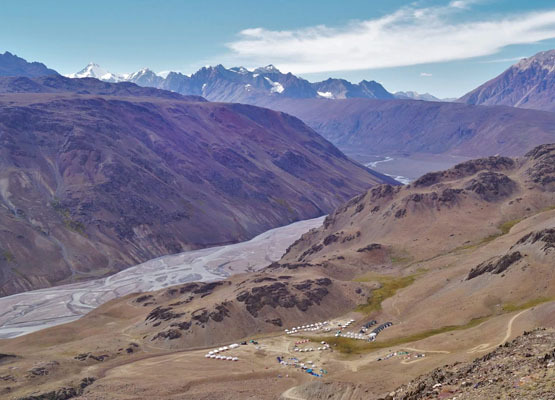 The landscape changed drastically from lush green hills of Manali to dry barren landscape of Spiti. But I was overwhelmed and stunned by the mystic beauty of this landscape. Our breakfast stop was at a Dhaba in Marhi. Paranthas were awesome and they even had an option of dry paranthas for the calorie conscious. The journey ahead was full of bumpy roads, irregular terrain and breathtaking view of the mountains, streams and waterfalls. Each mountain had a different colour and the supernatural beauty of that place cannot be put in words. 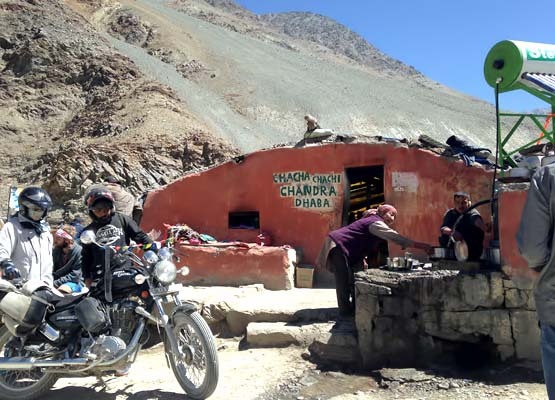 We reached Batal by lunch and our eatery was the famous Chandra Dhaba run by Chacha and Chachi, a very hospitable couple who served us a hearty meal with smiling faces – dal , rice and veggie. There aren’t many food options available at that high an altitude. Rice , dal, potatoes, bread, eggs and the world famous maggi are the only food options. After a good meal we headed towards Kumzum to start our trek, which was only fifteen minutes away. 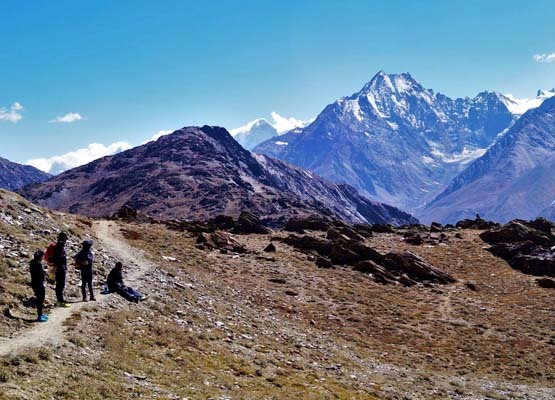 The trek from Kumzum to our camp was nearly 13 Kms about 5-6hours. Some places had a trail to follow and at some places rocks, which we had to cross over. It was very exciting and thrilling. 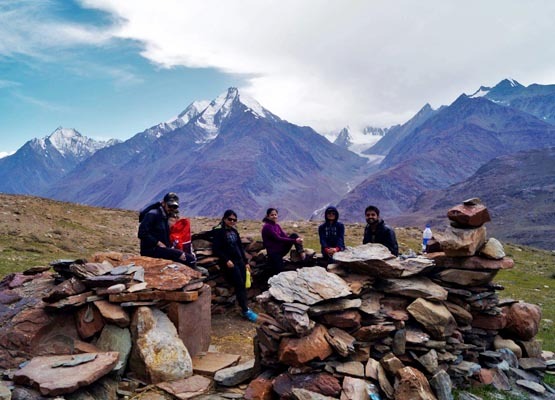 High altitude caused difficulty in breathing but the magnificent view of glaciers and peaks of Mulkila and Chandrabagha gave us enough energy to survive the mountain sickness. We finally reached the camp which was surrounded by mountains on all the sides. Had herbal tea and sat with other trekkers in a common big tent. Dinner was served and we retired early to bed. This was the most memorable day of my trip. We started early morning so that we could witness the different phases of the lake. There’s an interesting phenomenon about this lake – it changes colour depending on the position of the sun and the direction of the wind. We had an early breakfast at the camp and took the car till the last point and walked till the lake. The sight was mesmerizing. By 9am we were at the lake. The water was still and crystal clear. At that moment one could witness the mirror reflection of the mountains and clouds in the lake. We took a round of the crescent shaped lake which is about 4kms. At noon the winds start blowing and the ripple effect in the lake due to the movement of the wind causes the colour to change. 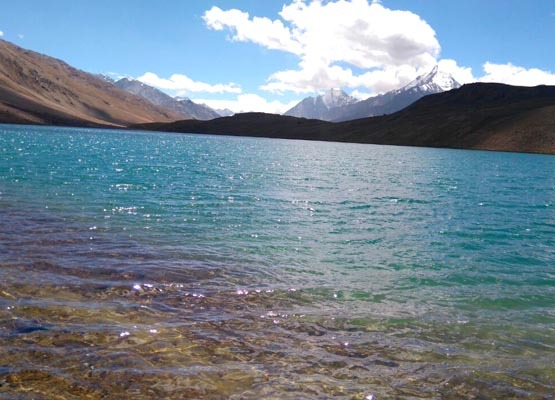 Slowly the entire lake changes its colour and turns turquoise blue. This is the most breathtaking phenomenon that I have experienced till now. Tanya with the camp owner Tanzin joined us at the lake. They had arranged lunch for us at the lake. We descended back to our camp around 4pm. In the evening I volunteered to make pakoras for everyone and eventually landed up making a vegetable curry too for dinner. Post dinner was spent chatting and singing songs. Next day was time to leave and with a heavy heart I packed my stuff for Manali, making a promise to myself to return to this mystic lake once again.